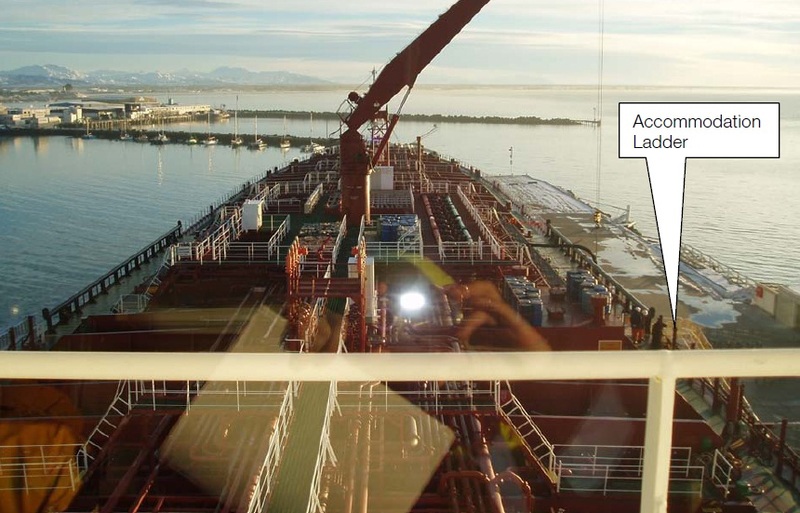 This investigation report refers to a man overboard incident that took place onboard a chemical tanker. An ordinary seaman fell overboard while he was trying to undo a rope lashing that was attached between the bottom of the pilot ladder and a cleat that was recessed in the ship’s hull and used to hold the pilot ladder against the hull. The accident took place during heavy weather and unfortunately the ordinary seaman was not recovered from the sea and must have been presumed dead. 12 June 2006, 1515 hours – The chemical tanker Formosa Thirteen departed the tanker berth at Seaview, Wellington Harbour, bound for Timaru. The weather was a south/southwest wind, 40-50 knots with poor visibility. The significant swell height at the harbour entrance was about four metres. The Pilot intended to disembark using the starboard side combination pilot and accommodation ladders that were located just abaft the mid point of the vessel, when south of Wellington Harbour entrance (see figure below – photograph showing view from the Pilot’s position on the bridge). 12 June 2006, 1551 hours – On advice from the pilot boat that it would not be possible for him to disembark outside the Harbour due to the heavy sea conditions, the Pilot decided he would carry on to Timaru with the vessel. The Pilot then prompted the Master to secure the pilot ladder, as he could not see any crew activity by the pilot ladder. When the Pilot was happy that the pilot ladder was being secured, he concentrated his attention on piloting the vessel. 12 June 2006, 1600 hours – The three seamen who were on watch, were directed by an instruction over the ship’s loud speaker system to secure the pilot ladder. The Bosun, who would normally supervise, was at the bow standing by the anchor. There were two ordinary seaman at the pilot ladder the Ordinary Seaman (that fell overboard later on) and Deckhand 1. Deckhand 2 had left his cabin and was on his way to assist them. 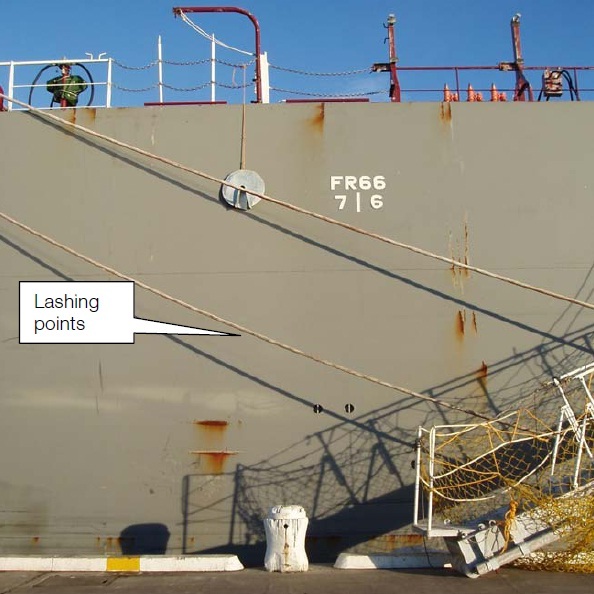 Deckhand 1 said to the Ordinary Seaman that he thought it was too dangerous to go down the accommodation ladder to unlash the base from the ship’s hull because of the rough sea conditions (see figure below – photograph showing gangway and lashing points). However the Ordinary Seaman said it was ok, and he would do it. 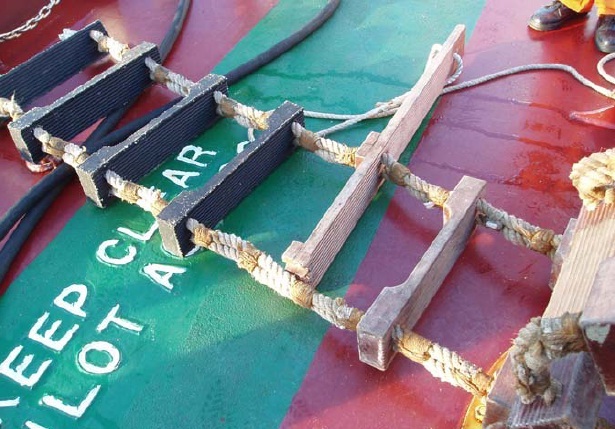 12 June 2006, 1608 hours – The Ordinary Seaman descended the accommodation ladder so as to undo a rope lashing that was attached between the bottom of the ladder and a cleat that was recessed in the ship’s hull and used to hold the ladder against the hull (see figures above and below). He was wearing overalls and a dark blue raincoat, over trousers steel cap safety boots, gloves and hardhat. He was not wearing a lifejacket or harness. Deckhand 1 did not watch the Ordinary Seaman once he had started to descend the accommodation ladder. Shortly afterwards, Deckhand 1 heard a loud bang. He rushed back to the top of the accommodation ladder and yelled out for the Ordinary Seaman. He could not see him and quickly realised he must have been washed away by the heavy seas. He immediately headed for the stern of the vessel yelling that there was a man overboard. As Deckhand 1 reached the accommodation he ran into Deckhand 2 who was coming out of the accommodation. He told him what had happened and that he needed to tell the Master. Deckhand 1 ran to the side of the vessel and threw a lifebuoy, with a light, into the water. It landed about 50-100 metres from the Ordinary Seaman who Deckhand 1 could just see in the water. He was unable to determine if the Ordinary Seaman was still moving. Deckhand 2 ran up to the second level of accommodation to telephone the bridge, but found it was engaged. 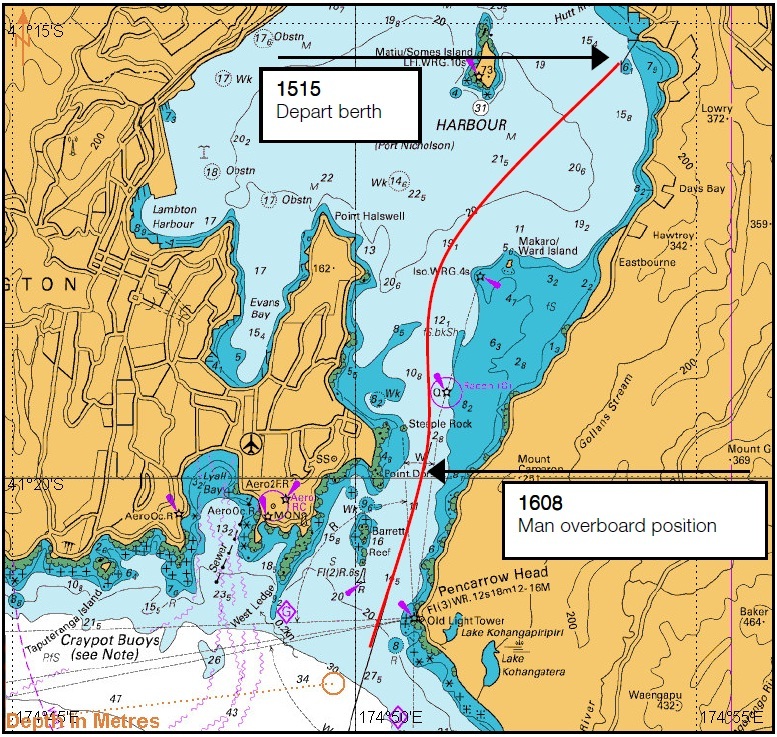 At 1608 hours, the vessel was abeam of Point Dorset, steering 197°(T) at a speed of about 8.9 knots (see figure below). The Pilot observed Deckhand 1 by the starboard gangway, shouting and gesticulating to the bridge and to the stern. The Pilot quickly realised there was a man overboard. He looked astern and saw the Ordinary Seaman in the water about 50-100 metres astern of the vessel. He was waving with one arm and appeared to be riding quite high in the water. At about this time the man overboard alarm was sounded. The Master immediately slowed the engine. The Pilot radioed Wellington Harbour Radio on Channel 14 but got no response. He then called the Pilot boat Tarakena which was standing by off Seatoun Wharf. 12 June 2006, 1610 hours – The Pilot sent a MAYDAY call on VHF Channel 16. Wellington Harbour Radio responded immediately and initiated a formal search and rescue operation. Formosa Thirteen was unable to turn around as she was in the channel and had limited room in which to manoeuvre. 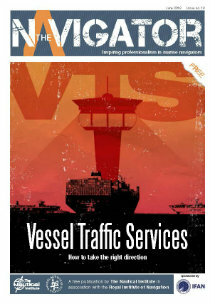 The vessel continued seawards and awaited instructions. 12 June 2006, 1620 hours – The pilot boat Tarakena arrived on scene and started searching for the missing crewmember. 12 June 2006, 1635 hours – A helicopter arrived on scene and also started searching. 12 June 2006, 1642 hours – Formosa Thirteen was instructed by the Police to re-enter the Harbour and proceed to anchor. The Police intended to board the vessel to carry out interviews of the crew. However, after the vessel was anchored in the harbour, it was decided that it was too hazardous for them to board, due to the weather. The ship’s ISM manual stated that there should be a deck officer present supervising at all times when raising or lowering the accommodation ladder or pilot ladder, however none was present on this occasion. There were no procedures that working lifejackets and a harness should be used when descending the ladder whilst the vessel was underway. The delayed order to raise the accommodation ladder, after it was decided that the Pilot would remain on board for the passage to Timaru, meant that the vessel was being increasingly subject to the force of the southerly gale as she proceeded southwards towards the harbour entrance. The combination accommodation and pilot ladder was visible from the starboard bridge wing. None of the bridge team checked to see whether it was safe to raise the accommodation ladder, when the order for this was given. Photo above: Broken rung from Starboard Pilot ladder. During the investigation it could not be determined if the rung was broken prior or after the incident. Include in the vessel’s ISM manual a procedure to cover the requirement for safety harnesses to be worn when working over the ship’s side and/or while working on deck in adverse weather conditions or at any time where risk of being washed overboard exists. 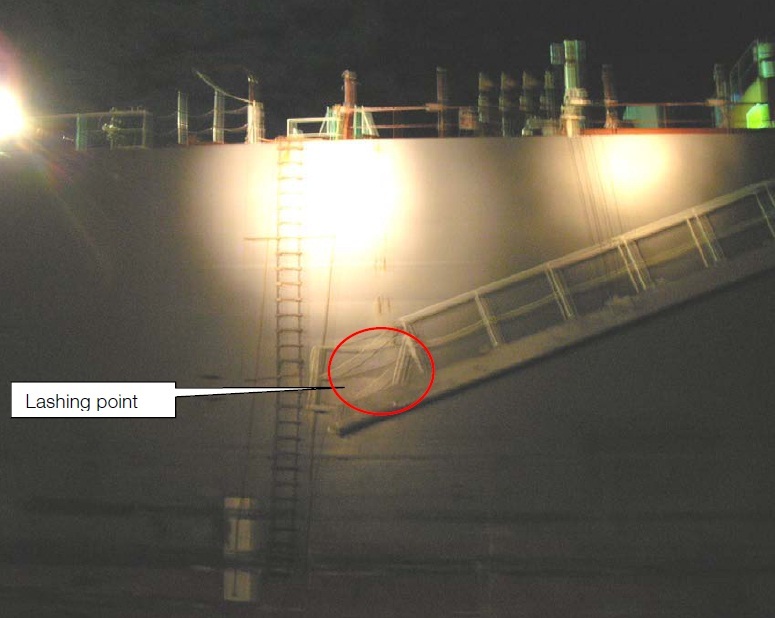 Where combination ladders are in use the decision not to disembark due to weather conditions should be made as soon as possible so the ladders can be retrieved in a safer environment.